The Captain took these incredibly tropical super hot peppers and did something quite special. The mix consists of Peach Ghost, Trinidad Yellow, Sugar Rush, Orange Moruga and Primo Yellow (7-pot) super hot peppers. Then we smoked this delightful array of citrus, peach and apricot blended peppers in cherry wood and infused them with fresh lime and tangerines. Wow. What a mix. Make sure to include smoked paradise in your next rub or blackening seasoning. This is a chile powder to remember. Supplies are currently limited. So get it while you can. Hot Pepper Health Benefits – Can You Afford To Ignore Them? 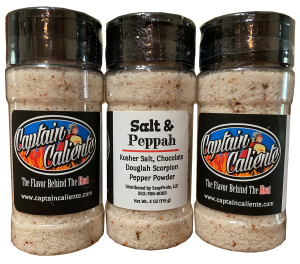 Captain Caliente Is Here To Save Us From Culinary Chaos - PC House Productions on Hot Pepper Health Benefits – Can You Afford To Ignore Them?